Even if you have never heard about Franz Kafka and have never read one of his books (novels The Trial, America and The Castle have been translated into several languages), you will surely notice his presence while visiting Prague. T-shirts, posters and mugs carrying the writer’s image are available at every souvenir shop across Prague. 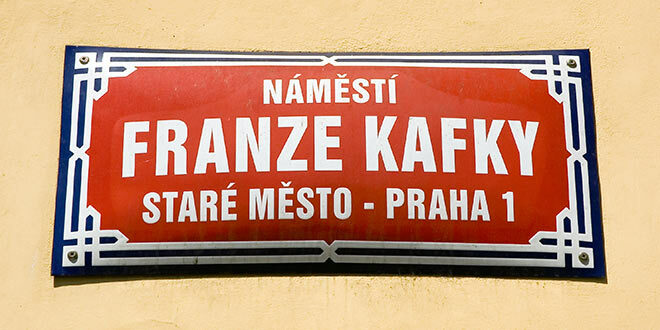 Places named after him include Kafka Square, Kafka Museum, Kafka Café and Kafka House at Golden Lane – that is the never-dying presence of Franz Kafka in Prague. 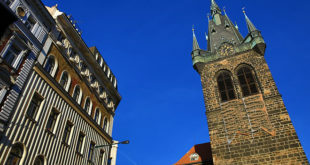 There is Franz Kafka Museum in Lesser Town and other numerous places with a personal connection or invent an association. Places that were personally occupied by Kafka include his birthplace, which is on the edge of Old Town Square and now houses a rather lacklustre exhibition; Dum U minuty, where he lived from 1889 to 1896; the Little Blue Cottage in Golden Lane, where he lived from 1916 to 1917; and the oppressive insurance office, now the Mercure Hotel, where Kafka worked from 1908 to 1922. Franz Kafka came from a Jewish family and grew up at a time when ethnic conflicts began to escalate in Prague. Kafka was born in the former Benedictine Monastery next to the Church of St Nicholas. Franz Kafka spent most of his life in Prague, even though he always felt like a stranger there – a German speaking Jew in a predominately Czech Catholic town. 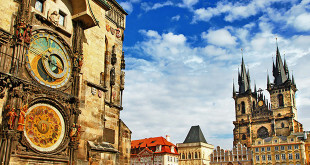 Consequently, there are many sites in Prague that are of some interest to fans of Kafka’s work. Klaus Wagenbach’s little “Travel Reader” highlights most of these sites (e.g., the writer’s birthplace, all the Kafka family residences around Old Town Square, Kafka’s apartment in the castle, etc.). If you’re headed to Prague, you could easily spend half a day retracing Kafka’s footsteps with this guide. The book includes a map and numerous photographs of the city as it appeared about 100 years ago so you can contrast today’s Prague with the Prague Kafka new. It also includes some short excerpts from Kafka’s works, mostly vignettes like the haunting “An Imperial Edict”, included next to the sections on the buildings where Kafka lived. At the end of his life Kafka left Prague and died of tuberculosis in 1924 in Kierling near Vienna. Non-traditional bronze statue, 3.75m tall, weighs 800 kg. The sculptor Jaroslav Róna found his inspiration in one of Kafka’s short stories – “Description of a Struggle”. David Vávra is the co-creator of the architectural placement of the statue. The statue was unveiled on 4 December 2003. Location: Prague 1, Dušní ulice a Vězeňská.